Crazy Snowboard is free today. What an awesome game! #VirginMedia phoned to tell me they would be at my house in 45 minutes to install the broadband. Bravo Virgin, Bravo. @RuutAckses What braodband do you have? Also need a name. Any suggestions? Thinking of starting a website (iPhone reviews/news). Has anyone used squarespace or have other recomendations? Now using @instapaper mobilizer in Tweetie. Really speeds up loading of pages. Ooo! Just noticed sharing on Google Reader uses Google's new URL shortening. Nice. @RuutAckses They already have one in the US. Surely it wouldn't be difficult to make it UK compatible. I really hope something gets done about the lock and home screens in iPhone OS 4.0. Anyone want an invite to Blippy? Pretty cool for sharing iTunes purchases and other stuff. Had a call from my girlfriend's uncle. Problem with his PC. Description: 'It's proper fucked mush'. Great. Not been Tweeting much due to lack of broadband. Thank Jobs for my iPhone else I would be totally disconnected. 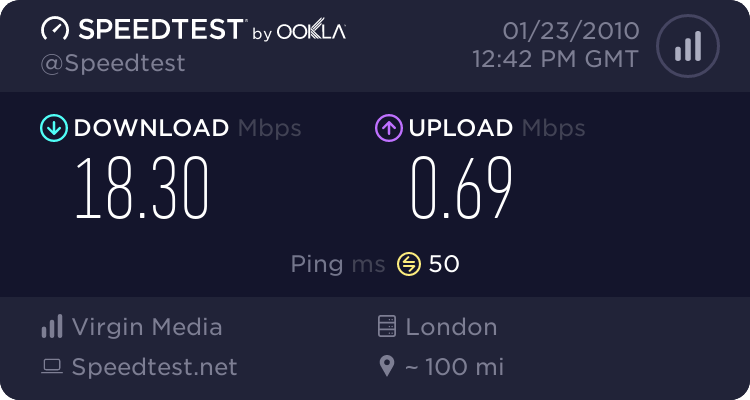 I'm not sure how much longer I can cope without broadband. Bring on the 50mb virgin. Virgin 50mb broadband being installed a week tomorrow :) anyone already got it? Any good? Starting to get REALLY pissed off with GPush on my iPhone. Anyone know a better solution? @andybeta Also, I retweeted this by accident. @andybeta Depends which platform you play on and which game. The Wii version is a mirror image of the GC version.